TIAONG, Quezon – The much awaited construction of the 56 kms. high-speed expressway stretching from Sto. Tomas in Batangas province to Lucena city in Quezon province has started with the groundbreaking on Tuesday in Bgy. Lalig here. Dept. of Public Works and Highways Sec. Mark Villar, Quezon Gov. David ‘Jayjay’ Suarez, and San Miguel Corp. President and chief operation officer Ramon Ang led the brief groundbreaking ceremony which kicked off the South Luzon Expressway Toll Road 4 (SLEX-TR4) project included in the centerpiece infrastructure program of the national government called ‘Build, Build, Build’. Villar said the SLEX-TR4 project, worth P13.1 billion, is part of Pres. Rodrigo Duterte’s masterplan of constructing a Luzon Spine Expressway Network connecting South to Northern Luzon cutting travel time from 19 hrs. to 9 hrs. from Bicol to La Union. The 56 kms. Tollway, a private-public partnership project spearheaded by SMC, traverses San Pablo City, Tiaong, Candelaria, Tayabas City and Lucena city. With the construction of SLEX-TR4, travel time from Sto. Tomas to Lucena city would be shortened from 3 hours to just 1 hour. The project is expected to be completed in 3 yrs. and its inauguration in 2022 before the end of term of Pres. Duterte, Villar said who was seated at the stage during the program between Gov. Suarez and SMC president and chief operating officer Ramon Ang. Also at the stage were House Minority Floor Leader and Quezon 3rd Dist. Rep. Danilo Suarez, vice governor Sam Nantes, 1st Dist. Rep. Trina Enverga, ex-Cong. Mark Enverga and Tiaong mayor Ramon Preza. Gov. 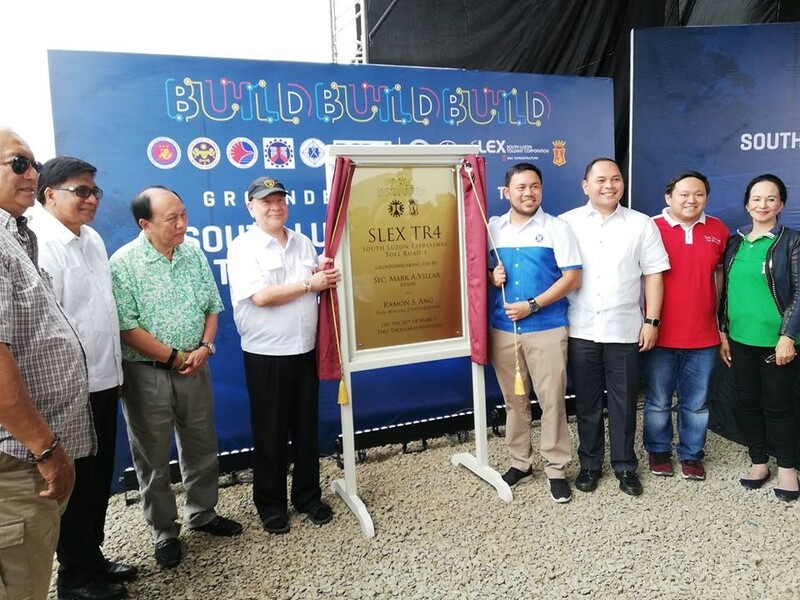 Suarez described the SLEX-TR4 project as a ‘game changer’ for the progress of Quezon citing a recent finding of National Economic and Development Authority that Quezon is the fastest growing province in Calabarzon region. He said that his meetings with municipal assessors and treasurers along with the landowners to be affected by the project paved the way for the major acquisition of road right of way even faster than in Batangas and Laguna portions of the project. The project would serve as a catalyst for Bicol region, Cong. Suarez said citing his House Bill 599 which mandated the construction of Quezon-Bicol expressway which is designed to link the 2 provinces starting from Malicboy in Quezon to Sorsogon in Bicol. “Sana hindi ako natutulog, pero mukhang reality na ito,” the elder Suarez said adding that with SLEX-TR4 project, progress in Quezon would speed up. After the program, Villar, Ang, Gov. Suarez, Rep. Suarez, Nantes, Preza and Tayabas city mayor Ernida Reynoso proceeded to unveil the marker site for the start of the nonstop construction of the project. In 2015, Pres. Benigno Aquino III has led an earlier ground-breaking ceremony at the same site but the actual construction of the expressway project has not proceeded due to road right of way problems.